"So, Sarah, what are you doing this weekend?" "Oh not much. Just leaving for Amsterdam tomorrow..."
I realized I had written about it on Facebook, but not here. Anyway, all tangents aside, I am really headed to the Netherlands tomorrow evening for a work-related venture! It's the first time I've left the country since my senior year of college when I spent a term abroad in Australia. So I've gotten my passport renewed, I've have Euros in my wallet, and I am all set haven't yet packed. 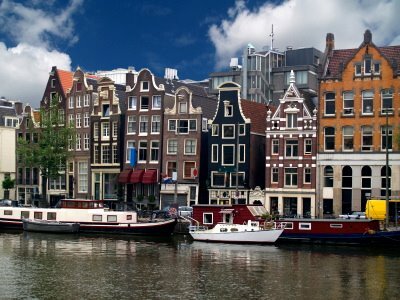 I fly from Boston directly to Amsterdam overnight tomorrow, and will arrive there on Sunday morning, leaving me with a full day of adventure before I report to the office to work Mon-Wed, and then fly home on Thursday, ripe with (travel tales and) jetlag. Have fun! Takes Pictures! Come home with stories! Ok, behind the Marriott closest to the train station in an Italian restaurant, a little small. Eat there. You'll thank me.